If you’ve never ridden on Hornby you’re in for a treat, and if you’ve never ridden off road at all then Hornby is the right place to learn. We have had a strong mountain bike community for over thirty years, and that time has resulted in a well maintained and extensive trail network with something to offer all riders. The majority of Hornby’s settlement took place on the waterfront, leaving the interior of the island in several large pieces. 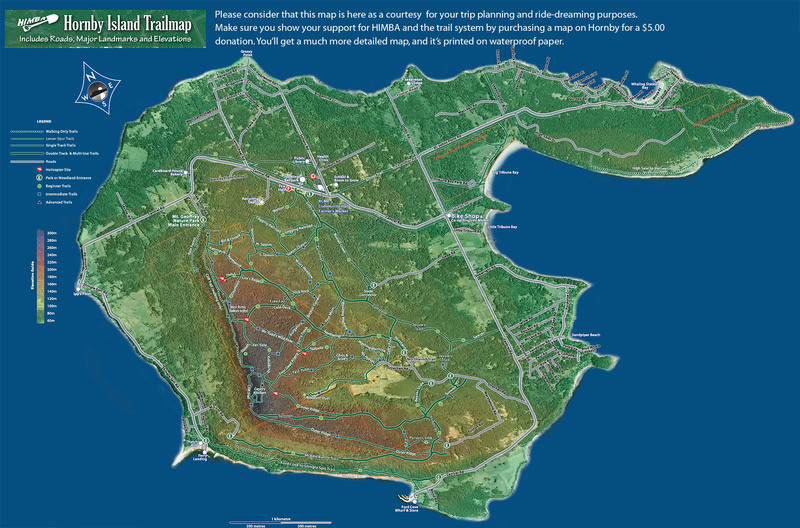 There are three main pieces that make up the bulk of the island’s trail bearing public lands; Mount Geoffrey Regional Park, Mount Geoffrey Escarpment Provincial Park, and a large Crown Land Reserve. The smooth nature of many of our trails is due to two things, a low annual rainfall, and good riding habits. If there was ever a time to practice not skidding this is it as Hornby’s dry climate helps cut down on water erosion in the winter, but in the summer it means that our trails are dry and easily chewed up by careless riding. Your good riding habits will help us keep our trails in prime condition. Thanks. The majority of the trails on Hornby were constructed by cyclists, and as a result most are well suited to bikes. One of the things that we are striving for is a comfortable relationship between cyclists, hikers, and equestrians, and as bikes can travel at great rates of speed and in relative silence it is important for cyclists to ride with care. Northwind and Cold Deck are the trails that most of the pedestrian and equestrian traffic use to access the top of Mount Geoffrey, so to avoid an unpleasant mishap, please limit speed to 20km per hour on these trails. The mountain offers some fantastic walks for all levels of fitness and ability. The Rain Forest Loop starts at the Lea Smith entrance and passes through an especially attractive area populated by some of the island’s remaining first growth trees. This trail is for walkers only as it is especially sensitive. Also starting from Lea Smith is the Cliff Trail, and although the beginning of this route presents quite a steep climb, the view from the cliff further up is worth it. All of Mount Geoffrey’s trails are open to walking, however there are some that were built primarily as bike routes. It is important to remember when encountering a cyclist on these narrow trails that it is far easier for a pedestrian to step to the side than for the cyclist to go off of the path to avoid the pedestrian. It is important for equestrians to stay on the multi-use trails only. These trails are Northwind, Summit, Coltsfoot, Beulah Creek, Slade Connector, Middle Bench and Cold Deck. These are the only trails that are capable of handling the impact of horses’ hooves and to ride on any others within Mount Geoffrey Park is against the park bylaws. Unfortunately, the majority of the smaller single-track trails are just too soft. It is especially important that horses not be taken on any of the cliff trails. Some of the major roads on Hornby have parallel pedestrian and cycling paths. These 1.5 metre wide gravel paths accommodate two way traffic and are an especially nice way to travel with small children. These trails run between the Cardboard House Bakery and the Ringside Market along Central Road and from the Ringside Market almost to Helliwell Provincial Park along St. John’s Point Road. This is one steep climb, you will gain 60 meters and most of that is in one short pitch, but hey, it does get you to the top rather quickly (if you survive). Bench Trail is a fast well packed superhighway of a trail running from Euston Road to tMt. Road with some fantastic clifftop views of the Beaufort Range on Vancouver island. It is fairly fast and fun but look out for other users as Bench is a popular trail. Built in 1992 for a bike race, the Dual is a two rider course which starts up in the trees before bursting into the clear on a bmx style banked course with jumps and tight corners that then sepperate into two side by side slalom runs. It is a quick 1.5 min descent that is meant to be done over again several times. Bring a friend! Drops steep and fast off Northwind into a rocky, rooty winter water course then over the lip of the bank off a log drop before curving through alders to join Slick Rock Trail. Beulah Creek runs along an old logging road from Colts Foot trail to the top of Slade Road–It is a fun ride both ways. The trail runs over boardwalks through some low wet areas and offers some good viewing of ferns, alder forest and general low-land terrain. Chris & Brad’s is a good piece of fast and twisty single-track with a steep hill near the top. It makes a great lead-up to the swoops of No Horses. Cliff Trail has everything and a lot of it is steep. From the park entrance at Lea Smith Road it immediately starts up the steepest hike-a-bike scramble on the Island. Because a long stretch of Cliff Trail is closed to bikes (safety concerns) riders must use Hot Rims and Slalom. The non-bike portion of the trail is a very steep climb popular with hikers. Once riders reconnect with Cliff Trail at the top of Slalom they can follow it to the peak of Mount Geoffrey and Summit Trail or turn off on a number of excellent singletrack trails. Cold Deck is part of the main route to the top of Mount Geoffrey and doubles as the main fire-access road. It makes for a nice climb with lots of room to chat and provides access to some of the best trails on the island. Coltsfoot runs along a disused logging road and at most times is quite smooth and flat. It does have a stretch of downhill between Washing Machine and Spasm Chasm that is pretty fun and technical. It is a good climb and often chosen to start a ride. Devil’s Kitchen is the trail equivalent of Hobbes’ natural state of mankind–”Nasty, Brutish and short”. Actually it’s not really all that nasty or brutish, but it does have one very steep part. Devil’s Kitchen is always ridden as a down. The trail has a nice flow at the beginning, then a steep section and then finishes up with some nice flow before hitting Four Dead Aliens. To follow on The Way downhill route, cross Four Dead Aliens and continue on Purgatory. Named for our departed friend Dylan Holiday, this newly restored trail comes off of Your Mom close to the bottom. We reworked the approach trail to be sustainable and provide a smoother approach to the main jump over Washing Machine. This jump is now a constructed cedar ramp with a take-off height of over six feet. The landing area has been cleared and buffed to and now includes a ride-out trail onto Coltsfoot. The jump has been tried and all agree that it is one of the biggest on Hornby. Check it out before riding. 300m of rolling singletrack, Far Side connects Slalom and Purgatory and puts you at the top of a ridge with sweet singletrack in either direction. Stretching between Ford Cove and the ferry landing at Shingle Spit, Ford Cove Trail is a great walk and easy ride. Now a Provincial Park the trail is smooth, gravelled and mostly level. Very rideable, even with kids in tow or on Trail-a-Bikes or trailers. There are a couple spots where bridges have been built over creeks and these have stairs on them, so be prepared to lift the bikes, trailers or joggers up a few steps. Four Dead Aliens is a fast, flowy trail that weaves in and out of trees on a consistent downhill slope. Multiple water bars and occasional roots add to the excitement with mini jumps all the way down. Great as a downhill but also offers an excellent single-track alternative to the Northwind/Cold Deck climb. Originally starting out as a Trials trail, Free Fall has morphed into a 300m black diamond jump and hit trail connecting Cold Deck, Northwind and Slick Rock. Start at Cold Deck, ride the skinny if you are up for it and enjoy! This trail links Northwind to Mister Toad’s Wild Ride. It is an intermediate climb or a nice fast descent. Genuine Draft is a newer trail, built for the Hornby BikeFest in 1996 and revitalized in 2011 for the Hornby Spring Classic. It’s a fun trail with nice treed scenery. Part of the trail passes through private land so please go quietly. G.F.T. is an old school single-track screamer that weaves in and out of small trees on a grown-over logging road. Sadly it is very short, but it makes a great addendum to Ridge Trail. Look for GFT as it comes off of Parsons Link on the left. Running parallel to the cliff from Cold Deck to Katimavic trail this intermediate downhill trail was designed by mountain bikers for mountain bikers and is bike only, so enjoy! The trail crosses Ozzmosis and Lox’s Bagel. This trail is a gentle intermediate climb from Summit to Four Dead Aliens has only one small challenging spot just before the end. Or if taken the other way it is a nice rolling traverse. Named for the program that supplied the volunteers who built it, Katimavic is a nice little path connecting Hot Rims and Cliff Trail to the end of Northwind Trail. Links Coltsfoot to Strachan Road at the foot of Summit Trail. Green with one black downhill and a bridge crossing of Ford Creek. Originally pioneered by Sasha and his Mom this trail winds through an amazing fern bed just before it exits on to Strachan Road. Logging Railroad takes you from the Firehall through a moister, mistier part of the park, with plenty of ferns to land in if you stray off your bike. After winding through the lower reaches of the slope it climbs up to meet Northwind, putting you well above the worst of the Northwind grind. Lox’s Bagel is built upon an old logging road so it’s pretty smooth and fast. It makes a nice part of a climb. Running from Slick Rock to Spasm Chasm this fun piece of rolling singletrack has a couple of steep sections. Named after the adventurous amphibian in the The Wind in the Willows. Linking Heli Site 2 at the top of Cold Deck Trail to the trail confluence of Four Dead Aliens, Tadpole and Furry Freak this classic Hornby trail is short (4-10min) and fun! It starts our flat and in moderate tree cover and then turns downhill and starts to swoop in and out of larger trees before ending at Four Dead Aliens. One of Hornby Island’s flagship trails, No Horses follows a creek ravine down the slope of the landscape. Swooping in and out all the way down you can get going superfast, and the flow keeps coming! Enter onto No Horses from the end of Chris & Brad’s or, if you are coming from Northwind on Not No Horses take a left at the log. At the bottom there’s a little booter onto Strachan Valley Road, or stay left and fly through the forest on Mark’s Trail. Northwind is the main trunk doubletrack to access almost all of the riding on the mountain. Heading up from the parking lot near the end of Strachan Road (Look for the Northwind Trail sign) After climbing about 2/3 of the mountain it heads right along the side of the incline while Cold Deck continues up and out to Cliff Trail. Follow Northwind right to connect to Lox’s Bagel, Spasm Chasm and other classics of Hornby riding. Outer Ridge runs from the top of Summit to Bench Trail and offers amazing views of the Vancouver Island mountains as well as a great dry down or solid climb. Ozzmosis • Beginner • 300m From the Ozzi album of the same name this fun down or hard up green trail will satisfy your urge for bats and doves. This is a very fast downhill singletrack that takes you from Farside across Mr. Toad’s Ride and then dumps you out on Northwind Trail and connects to Bitchin’ Camaro. Sawyer Trail is a beginner level .5 kilometer access trail that leaves Central Road at the water tower between Seawright and Sandpiper Roads and joins on to Jessie’s Trail. The top of Slade Road is one of the most popular access points for Hornby’s Trail Network. It is also the one nearest to the Bike Shop. Slade Connector is a short climb past the entrance to Buelah Creek Trail and up to Colt’s Foot Trail. Summit climbs from the gravel pit to Cliff Trail and overlooking the ferry landing. Summit Trail is a nice quick way to the top or a fun fire road downhill. It is also the site of our Summit Plummet DH race. Another fast descent, Test Tube links the Four Dead Aliens to the top of Chris and Brad’s, and continues out to Northwind past the end of Tadpole. Test Tube has some fun, tight, off-camber turns on the way down. This is a fun, twisting trail, full of the biggest drops and jumps on the mountain. This trail is a black diamond (very advanced) trail. The drops are 3-10 ft. But, don’t let that stop you! The trail should only be ridden downhill for all the stunts are facing that way. Your Mom ends up at the intersection of Washing Machine and Coltsfoot.